The National Textile Museum in Kuala Lumpur is aptly located in the heritage building, Sultan Abdul Samad Building, which was designed by the famous British architect A.C. Norman. The museum houses a collection of 486 textile material, displaying the richness of Malaysian diversity as well as historical development of textiles in Malaysia. The museum is divided into 4 different galleries, namely the Pohon Budi, Pelangi, Teluk Berantai and Ratna Sari. The Pohon Budi (Tree of Gratitude) explores various prehistoric fabrics and their origins, as well as displaying to visitors their development and dissemination through trade. Visitors will also see the many tools, material, ancient textile making techniques focusing on Malaysia’s famous textiles such as the pua kumbu of the Ibans in Sarawak, telepuk, songket and tekatan. Walking through Pelangi (rainbow) will display to visitors traditional textiles that are multi-coloured and are well-reflected in the Chinese and Baba Nyonya communities. Through Teluk Berantai, visitors will witness the patterns in the making of the songket, a gold embroidered textile of the Malay community. Other textiles include the tenun (woven fabric), telepuk (cotton or silk imprinted with floral motifs) and kain berayat (textiles imprinted with scripts). Ratna Sari may seemed like a deviation to visitors, as it displays various jewelry, accessories and adornments of the different ethnic communities in Malaysia, but it is no less interesting. Here, visitors will be shown accessories made of gold, silver, beads, copper and even plants, such as crowns of royalty, cucuk sanggul (hair pin), pending (silver waist buckle) and many others. 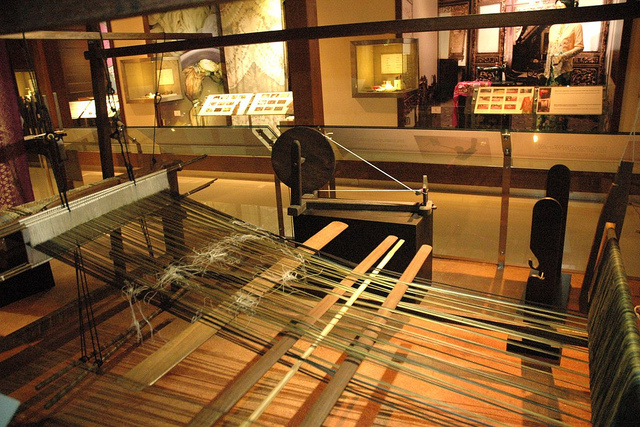 The National Textile Museum is a great place to learn more about the depth of Malaysia textile-production culture and history. The National Textile Museum is located at Jalan Sultan Hishamudin, at the Sultan Abdul Samad Building. It is accessible via LRT, just opposite the Masjid Jamek station. National Textile Museum is opened daily from 9am to 6pm and closed during Hari Raya. Admission to the National Textile Museum is free. Nice sky bar and nice room overlooking the Petronas Twin Towers! Value for money for a 4 stars hotel and its location. Studio and apartment type of accommodation, suitable for both family and business travelers. Located in the vibrant city center with plenty of dining and shopping options.